Wikipedia, the giant and free online encyclopedia containing more than 20 million articles contributed by a global volunteer community of more than 100,000 people, Reddit, WordPress, Mozilla and other popular websites have gone dark to protest controversial bills being debated in Congress. 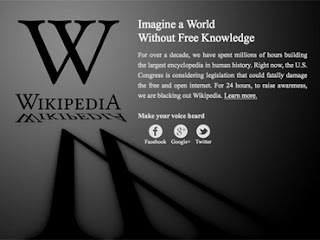 A statement by Wikipedia founder Jimmy Wales declares, “Today Wikipedians from around the world have spoken about their opposition to this destructive legislation. This is an extraordinary action for our community to take - and while we regret having to prevent the world from having access to Wikipedia for even a second, we simply cannot ignore the fact that SOPA and PIPA endanger free speech both in the United States and abroad, and set a frightening precedent of Internet censorship for the world."